The key to successful spot removal is getting to it as quick as possible. A wet/dry vac is great to have as well. For carpet or upholstery cleaning, put a thick pad of toweling over the spot, weight it down with books, and leave it there overnight to “wick up” any remaining moisture. 1. Acid – Apply a solution of baking soda and water until acid has been neutralized. Then apply ammonia solution and rinse with cold water. 2. Alcohol – Apply detergent solution. Blot. Apply vinegar solution. Blot. Bleach with hydrogen peroxide if necessary. Rinse with cold water. Blot dry. 3. Blood – Scrape off dried blood and apply cool detergent solution. Blot. Apply cool ammonia solution. Blot. Rinse. Blot dry. If stain remains, apply rust remover or bleach with hydrogen peroxide. 4. Candle Wax – Scrape off all you can. Ice cubes will make it brittle for easier scraping. A hot iron (on low heat setting) over a damp cloth will melt and absorb remaining wax. Apply dry-cleaning solvent. Blot. 5. Candy – Scrape off all you can with a dull knife. Sponge with detergent solution. Blot. Rinse. Be sure all traces of sugar are gone. Sugars left in carpet will cause a rapid re-soiling problem. 6. Chocolate – Scrape off all you can first. Sponge with dry-cleaning solvent. Blot. Sponge with detergent solution. Blot. Rinse. If stain remains, bleach with hydrogen peroxide. 7. Cigarette Burns – If the burn is slight, rub with dry steel wool — or if you feel confident, trim the damaged tufts. If the burn is bad, take a razor blade and scrape some fibers from a hidden area and use super glue to patch the burn with the fibers. 8. Coffee – Blot with detergent solution. Rinse. Blot with vinegar. Rinse. Air dry. If stain remains, sponge with dry cleaning solvent. Bleach remaining stain with hydrogen peroxide. Coffee is a very difficult stain, and can in many cases be permanent. 9. Crayon – Scrape off all you can. Just as with candle wax, use a hot iron and a damp cloth to melt and absorb the remaining wax. Apply dry cleaning solvent. Blot. Apply detergent solution. Rinse. Blot dry. 10. Grass – Apply detergent solution. Blot. Rinse. Blot. Apply ammonia solution. Blot. Apply vinegar solution. Blot. Rinse. 11. Greasy Foods – Apply dry cleaning solvent. Work to center to avoid ring. Blot. Apply light detergent solution. Rinse. Blot dry. 12. Gum – Use aerosol gum freeze or ice cube to harden the gum and make it brittle, then strike and break into pieces. Scrape them up with a dull butter knife. Remove residue with dry cleaning solvent. 13. Ice Cream – Don’t wait. Blot up all you can immediately with a dry cloth. Apply ammonia solution or protein digester. Rinse. If area is large, shampoo afterward. 14. Ink – Sponge with detergent solution. Rinse. If stain remains, saturate with cheap hair spray and blot. Always work from the outside in to avoid making the spot bigger. 15. Jam/Jelly – Apply detergent solution. Let sit to soften. Blot. Apply vinegar solution. Blot. Rinse. Blot dry. 16. Lipstick – Scrape off all you can, taking care not to spread the stain. Apply dry cleaning solvent and blot repeatedly until color is gone. Apply detergent solution. Blot. Apply ammonia solution. Blot. Rinse. Blot. 17. Mildew – Dry-brush to remove as much as possible. Sponge area with disinfectant solution. Blot. Sponge with ammonia. Rinse. Bleach with hydrogen peroxide. 18. Mud – Allow to dry and vacuum or brush off as much as possible. Apply detergent or ammonia solution. Blot. Rinse. Blot dry. If stain remains, apply dry cleaning solvent. Blot dry. 19. Mustard/Ketchup – Apply vinegar solution. Blot. Apply detergent solution. Blot. If stain remains apply rust remover or hydrogen peroxide solution. Blot. Do not use ammonia or alkaline cleaners. 20. Nail Polish – Blot acetone or non-oily nail polish remover through the stain into a clean absorbent pad. No acetone on acetate, modacrylic, silk, or wool. Use amyl acetate from a pharmacy. Flush with dry cleaning fluid. Air-dry. 21. Oil – Apply dry cleaning solvent. Work to center to avoid ring. Blot. Apply light detergent solution. Rinse. Blot. 22. Paint/Varnish – Oil-based paint or varnish: if fresh, flush with mineral spirits. If dry, carefully soften with lacquer thinner (test first for fabric damage) then flush with appropriate solvent. 23. Pet Stains – Blot out all liquid possible by placing a clean towel on the spot and standing on it. Apply bacteria/enzyme digester according to directions. When dry, remove any remaining stain with detergent solution. Rinse. Blot dry. 24. Rust – Rub with steel wool or rust remover. If you use professional rust remover, be careful not to get any on your skin. Don’t apply it to glass, porcelain or enamel surfaces. Rinse. Blot dry. 25. Shoe Polish – Gently scrape off all you can, being extra careful not to spread the stain. Blot dry cleaning solvent through the stain into a clean absorbent pad. Sponge with detergent solution. Blot. Sponge with ammonia. Rinse. If stain remains, try alcohol, then hydrogen peroxide. 26. Soft Drinks – Blot up all you can. Blot with detergent solution. Rinse. Air dry. If stain remains, soak with glycerin for 30 minutes and rinse. 27. Tar – Scrape up all you can, then remove residue by blotting with paint thinner or dry cleaning solvent. Blot with detergent solution. Rinse. Blot dry. 28. Vomit – Scrape up as much as possible. Apply bacteria/enzyme digester according to directions. When dry, remove any remaining stain with detergent solution. Rinse. Blot dry. 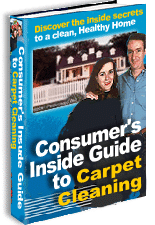 Want other great carpet cleaning or upholstery cleaning tips, tricks and insider secrets, then check out our blog for more great information by going here.